I have a score of 65 (PTE score 85) I plan to apply for ICT Business Analyst but my wife has a Bachelor of Commerce and working in Finance & Accounting with 5+ years of experience. Her IELTS score is L7.5, S 7.0, W 6.5, R 6.5. So that means I cannot claim additional 5 points for my spouse. What should I do to increase the points. Thank you. Do you suggest that I go with subclass 190? Is there any other way that I can claim additional 5 points for spouse qualification/experience although I’m in IT and she’s in Finance & Accounting? Is the immigration visa fee separate for subclass 189 and subclass190? There is no other way to claim spouse points if the calculator does not show it. Immigration fees for both 189 and 190 is same. Really appreciate your kind reply. I have 1.6 years as Technical Analyst and 5.6 as Technical Manager outside of Australia. Will ACS deduct 2 years of my work experience? If so, 5 years of experience is what I can claim. Would I be able to claim 10 points or 5 points? If you apply for business analyst code, chances are high that your full manager Experience will be counted as zero too if the daily work does not match business analyst job requirements. I understand. It’s the title the is confusing. Otherwise, the job requirements is of a business analyst role. Should I be worried then? I understand. It’s the title that is confusing. Otherwise, 80% of my job requirements are of a business analyst role. Would you recommend any other approach then? The number of points that you can claim will depend on how many years ACS gives as ‘relevant’ in their report. You can only claim the years marked as relevant by ACS for points. Thanks Anil! So that means ACS will not cut any experience from my experience if it relevant even if I’m working outside Australia. ACS will deduct at-least 2 years. 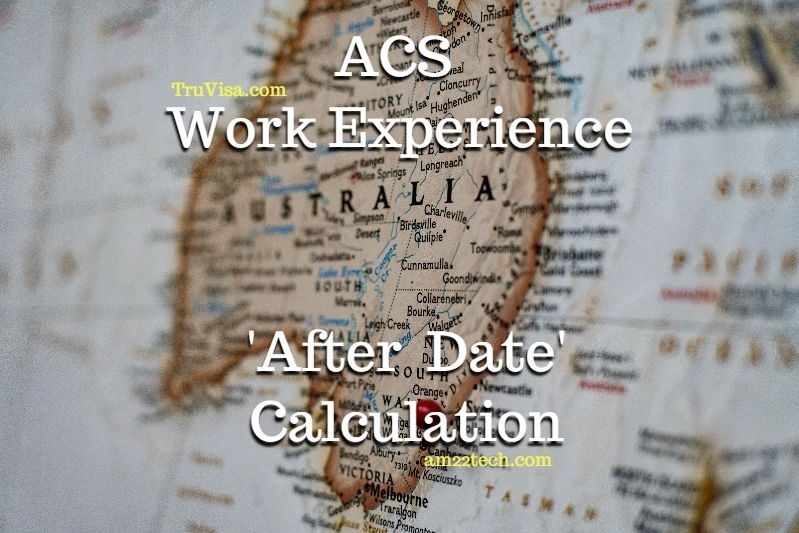 ACS work experience 'After month' date means the day in same month can be used as start date in Australia EOI, not the next month. 2 or 4 yrs deducted. My wife has a BCom degree and though she handles finance&accounting, she also handles IT work a lot. Since she is working in a small enterprise, almost all IT operations are handled by her only. Let’s say 60% -65% of her work is IT related. She’s working in the same organisation for more than 5 years. Would she be eligible to apply in IT field so that we can claim 5 points as I plan to apply in the ICT Business Analyst code. Her designation is simply ‘Manager’. The designation does not matter but the daily job duties do. I cannot say how ACS is going to evaluate based on what is written in your spouse work experience letter about what she does in her daily activities.